Perhaps my favorite item each year at the farm is the candy-like cherry tomatoes we get to pick on our own. I thought I would highlight them this week, as well as offer a few recipes containing eggplant and green peppers, as they are still plentiful and likely to be in each day’s distribution this week. Freeze them. Cherry tomatoes freeze beautifully whole. Simply line a rimmed baking sheet with a double layer of paper towels. Place tomatoes in a colander and rinse well. Drain and gently pour tomatoes on prepared baking sheet. 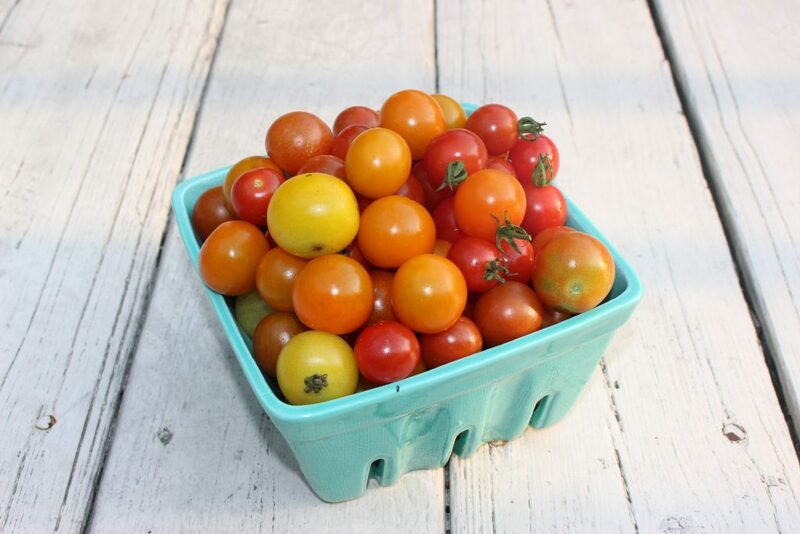 Take additional paper towels and place on top of the tomatoes, rolling and patting them gently to try and soak up any last remaining water droplets on the tomatoes. They should be as dry as possible before freezing. Remove any stems and discard any split tomatoes. Place dried tomatoes in a large re-sealable plastic baggie and close tightly, removing as much air from the bag as possible. Freeze until ready to use. Whole frozen tomatoes are great right from the freezer to the oven or pan roasted for pasta. You can also use them in soups and stews. Pickle them. 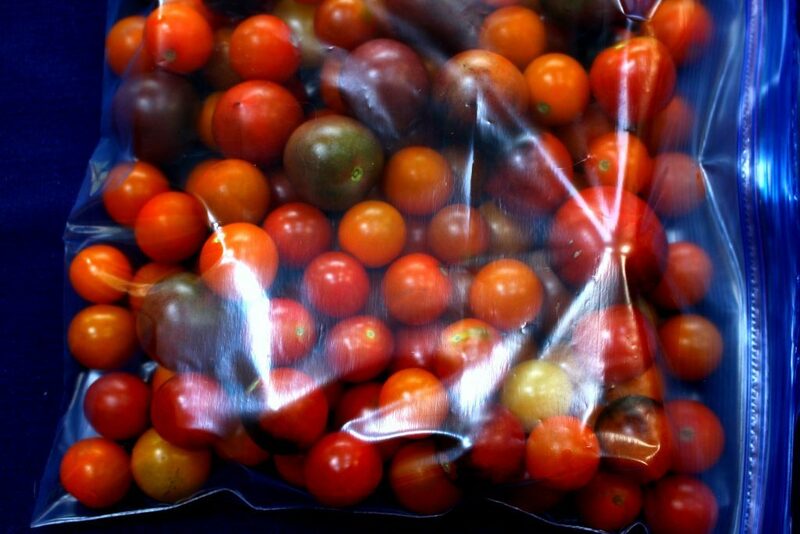 Check out this cool recipe for quick pickling whole tomatoes (click here). Oven or pan roast them with olive oil, salt, and pepper. Once they have popped open and begun to release their juices, add garlic and cook for a bit longer. Toss with pasta, spiralized zucchini or cucumber, or add to pizzas or grain salads (see recipe below). Consider oven drying them into intense morsels that can be used like any other sundried tomato (click here). The dried tomatoes can be covered with oil and kept in the refrigerator or frozen for later use. The following recipe is great for it’s versatility to make a number of different dishes. Use it as a pasta sauce either over pasta or spiralized zucchini. Make breaded chicken cutlets or eggplant slices and serve the sauce over the chicken or eggplant. Grill a combination of vegetables and serve the sauce over them. The possibilities are endless for this highly flavorful sauce. Preheat oven to 450. Drizzle a rimmed baking sheet with light olive oil. Toss tomatoes and garlic with olive oil. Spread evenly on prepared baking sheet. Sprinkle generously with sea salt and pepper. Bake, stirring occasionally, for about 15 minutes, or until most tomatoes have blistered and popped open and there is plenty of juice accumulated in the pan. Transfer tomatoes and juice to a medium bowl. Mix in basil. 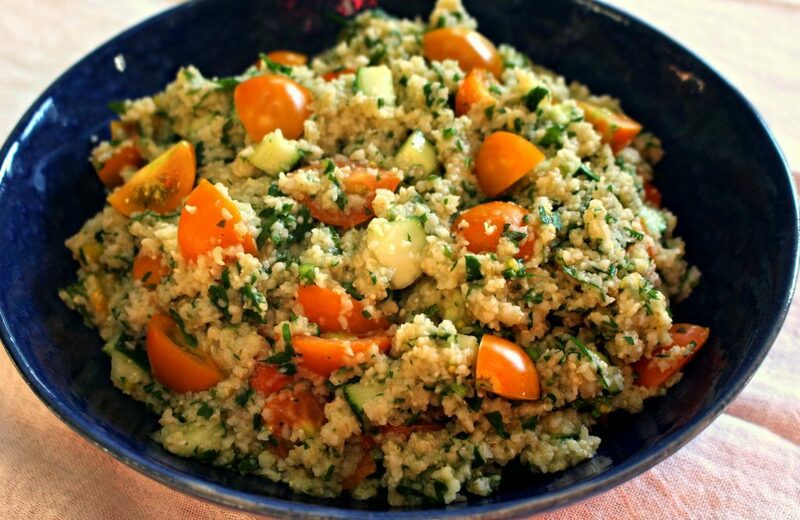 There are many recipe variations for tabouli, a delicious Middle Eastern bulgur salad that typically includes cooked bulgur, tomatoes, cucumbers and lots of parsley. My version kicks up the protein content by adding chickpeas so that it can be eaten either as a side dish or a vegetarian main course. I also use less parsley than traditional versions simply to suit my own taste buds. Finally, I add ground cumin, which is not traditional, but adds a bit more interest to the dish. Place water and ¼ cup lemon juice in a medium saucepan. Stir in bulgur and salt. Bring to boil, reduce to simmer and cover. Cook for 10-12 minutes or until water has been completely absorbed. Allow to cool, uncovered, stirring occasionally. Once cooked bulgur has cooled, place it in a large bowl. Mix in the rest of the ingredients and stir until well combined. Taste for salt and pepper levels and add if needed. Serve at room temperature or refrigerate for later use. 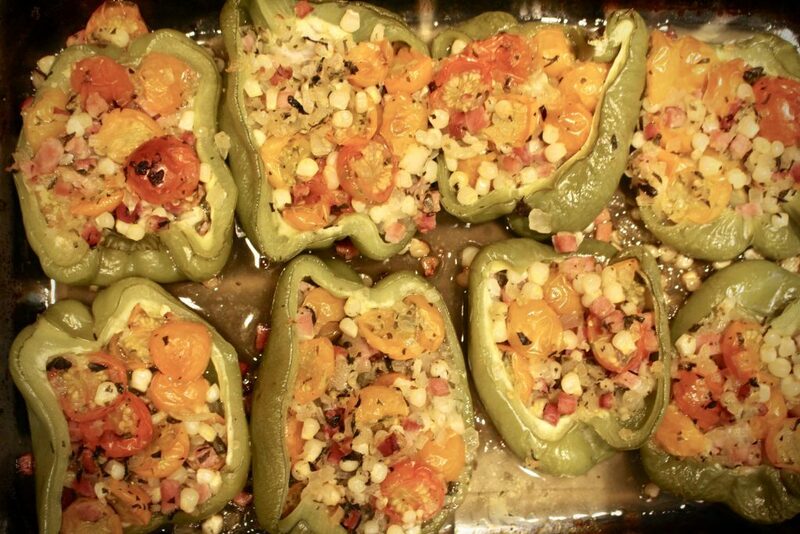 Stuffed whole peppers can be a pain because they require hollowing out and then blanching before stuffing. While this version cooks for an hour in the oven, it is much quicker and easier to prepare overall than stuffed whole peppers. This recipe, using fresh corn and our intense cherry tomatoes is a delicious version of stuffed peppers that screams for a good crusty bread for sopping up the wonderful juices created by our highly flavorful tomatoes. The recipe calls for a small amount of ham for flavor, but if you prefer a vegetarian version, you can leave out the meat. 1. Preheat oven to 400℉. Cut off bottom of leek where it starts to turn dark green. Cut the remaining part of the leek in half lengthwise, then slice each piece into into thin slices. Clean well and dry. If using an onion, finely dice the onion. 2. Heat one tablespoon oil in a large skillet over medium heat. Add leek or onion, corn kernels, ham, and garlic. Cook, stirring occasionally, until leek or onion is soft, about 8-10 minutes. Add tomatoes and cook for a few minutes, stirring to incorporate tomatoes evenly into mixture. Remove from heat and add minced basil. Season to taste with salt and pepper. 3. Meanwhile, cut each pepper in half lengthwise at a place where the halves will lie fairly flat in a baking pan. Remove seeds and white parts. Place 1 tablespoon oil in the bottom of a large casserole dish and spread it evenly to coat dish. Place pepper halves cavity side up in dish. Spoon cherry tomato mixture evenly into the cavities of the peppers, allowing them to overflow if needed. Drizzle pepper halves with oil. Cover dish with foil and place in oven and cook without disturbing for 45 minutes. Remove foil and cook an additional 15 minutes. Peppers should be soft and juices should have formed in the bottom of the pan. Serve pepper halves on plates, spooning some of the liquid left in the pan over each one. Great served with a good quality crusty bread. While the heirloom tomatoes are delicious as always, they are not as plentiful this year as in past years. You may feel you don’t have enough to go around with everything you’d like to do with them. That is why I love this pizza recipe, which yields a delicious pizza without any tomato at all and highlights the eggplant and green peppers that are still plentiful. 1. Stir yeast and sugar in warm water and allow to sit for 5 minutes or until it foams. In the bowl of a standing mixer, mix flours and salt using the paddle attachment. Add yeast mixture and mix well. Remove paddle attachment and replace with dough hook. Mix until dough comes together in a ball. Test the dough with your finger. It should be tacky but not overly sticky. If needed, add water by tablespoonful until dough is the right consistency. Using dough hook on speed 3, knead for 8 minutes. (if you do not have a stand mixer, mix yeast mixture into flour/salt mixture by hand until well incorporated and adjust water level as needed per above instructions. Knead dough by hand for 10 minutes, then proceed with the rest of the recipe). Turn dough out into a well greased bowl, smoothing it into a ball with your hands. Cover with plastic wrap and allow to rest for 1- 1 1/2 hours or until approximately doubled in size. Punch down dough and separate into two equal pieces. You will use only one for this recipe. The other can be frozen or refrigerated for later use. 2. Meanwhile, in a large skillet, heat 1 tablespoon olive oil until hot. Place second tablespoon of oil in a small bowl. Crush 1 clove garlic into the bowl and whisk together. Allow to sit. To the hot skillet add the onion, eggplant, zucchini, and peppers. Saute over medium heat, stirring occasionally, for 5 minutes. Slice the rest of the garlic thinly and add to the pan. Cook stirring occasionally for 5-10 minutes more, or until vegetables are soft and beginning to brown. Add oregano, chili flakes, anchovy paste, and red wine vinegar. Cook, stirring frequently, until vinegar is cooked off, about 3 minutes. Remove from heat and add basil. Taste for salt level and add additional salt if needed. 3. About 1/2 hour before the dough is done rising, place a pizza stone in the cold oven and preheat to 550℉ (or 500℉ if your oven doesn’t heat that high). If you don’t have a pizza stone, grease a baking sheet or a pizza pan but don’t preheat it in the oven. (you can also prepare your grill for a pizza using your preferred method). 4. Roll out pizza dough to about an 8 to 9” disk. Prick dough all over with the tines of a fork (this keeps the dough from forming large bubbles) . Transfer dough to a floured pizza peel or unrimmed baking sheet. (or to your prepared baking pan or pizza pan) Slide onto the preheated pizza stone and bake for 6 minutes, or until crust is set and just a few browned spots appear. Using a spatula or pizza peel (if using a pizza stone), transfer to a work surface and quickly brush pizza dough with the garlic olive oil (use just the oil, leave the bits of garlic largely behind). Sprinkle lightly with sea salt. Sprinkle with cheese, then lay vegetables evenly over the top. Return to the oven and bake for 4-6 more minutes or until cheese is melted and crust is lightly golden at the edges. Garnish with minced fresh basil. Serve hot. This soup is flexible in that you can sub in vegetables or use more or less of one vegetable as long as the total amount remains about the same. It is a delicious way to use up small amounts of different items such as eggplant, mini eggplant, peppers, and tomatoes. In a medium stockpot, heat oil over medium heat. Add onion and garlic and cook, stirring occasionally, until onion is soft, about 5 minutes. Add eggplant and peppers and cook, stirring occasionally, until eggplant begins to soften, about 5 minutes (if mixture begins to stick, add a bit of water or more oil). Add tomato paste and cook, stirring frequently, until fragrant and tomato paste turn dark (it caramelizes), about 5 minutes. Add chopped tomatoes and cook, stirring occasionally, until tomatoes soften and give up their juices, about 7-10 minutes. Add broth and thyme and bring to boil. Reduce to a simmer, cover, and cook for 10 minutes or until eggplant is soft. Uncover and add summer squash. Cook, uncovered, stirring occasionally, until squash is tender, about 10 minutes longer. Remove from heat and stir in lemon juice and basil. Serve in soup bowls sprinkled with Parmesan cheese (optional). I love soup any time of the year. Thanks for the recipe! Enjoy. I bet it is good cold too!